Help students to form reasoned opinions on refugee issues, based on systematic research from credible information sources. To form an understanding of the causes of forced migration. To evaluate different views on Australia’s refugee program and the impact of multiculturalism on Australian society. To instil in both WSSC and LTU students an enjoyment of learning and pride in being intelligent. Provide an opporunity for WSSC students to the sample the university experience and see university study as a meaningful career pathway after high school. Give LTU Bachelor of Arts students valuable hands-on experience in group leadership and facilitation. What is the definition of a “refugee”? How many refugees arrived in Australia during the year 2010-2011? What were the top ten countries of origin for refugees resettled in Australia in 2010-2011? Find out what is happening in each of these countries that might be forcing people to leave. 2. Complete the activity African Journey: Tutorial 1, based on the three-part SBS TV documentary Go Back to Where You Came From. The family featured in this video clip live in Albury-Wodonga and are part of the La Trobe University student community. 3. Complete the online simulation game Assylum: Exit Australia. What was the purpose of housing migrants at Bonegilla Army Camp? During what years was Bonegilla used for migrant accommodation? How many refugees came through the camp during this period? What countries did the refugees come from? Why did the refugees come to Australia during this period? 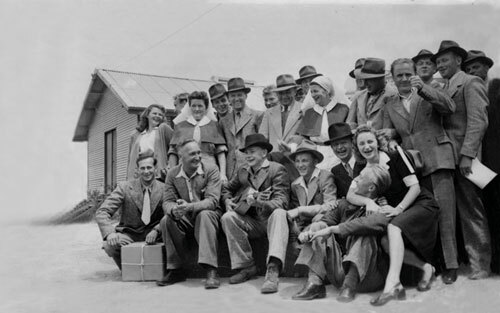 What challenges did refugees encounter on arrival at Bonegilla? “Go Back to Where You Came From,” SBS (2011). “Immigration Nation: The Secret History of Us,” SBS (2011). “Insight: Banning the Burqa,” SBS (2010). Ben Habib, “An Interview with Bruce Pennay — The Role of the Border Region in Our National Story,” Politics Albury-Wodonga. Julian Burnside, “Asylum seekers and Australia,” La Trobe University Podcast. Renae Schilg, “Interview with Dr Penny Egan-Vine — Murray Valley Sanctuary Refugee Group,” Politics Albury-Wodonga. Charles Fahey, “Migration and the gold rush,” La Trobe University Podcast. Jamese Hathaway, “Asylum seeker policy: International law expert,” ABC Radio National – Breakfast. Kon Karapanagiotidis, “Asylum Seekers: Why So Frightened?” The Wheeler Centre. Debbie Mortimer, “Refugee lawyer Debbie Mortimer,” ABC Radio National – Breakfast. Ben Habib, “Surviving Stalin, Hitler and White Australia,” Politics Albury-Wodonga. Ben Habib, “Various Perspectives on the Assylum Seeker Debate,” Politics Albury-Wodonga. Ben Habib, “Event Review: Wodonga Carnivale,” Politics Albury-Wodonga. A Window into Contemporary Indian Society, 16th September 2011. History Study Companion — The Chinese Revolution, 31st July 2011. Wodonga Senior Secondary College and Latrobe University: Social Movements Day, 7th September 2011. WSSC Year 11 students visit La Trobe University Albury-Wodonga for workshop on social movements, 7th September 2011. This is an extraordinary website Ben – a fantastic resource for exploring this fascinating topic and especially so when coupled with the Block 19 excursion – until recently one of the almost hidden treasures of the heritage of Albury Wodonga. The Murray Valley Bushwalkers completed a walk in the footsteps of the migrants last Saturday from the Bonegilla platform to Block 19 followed by a guided tour led by Lil Waugh. i think we need to encourage some politicians to visit both this website and Block 19 for some re-education. Thanks Tony. I hope the WSSC students will appreciate the history of Bonegilla during their visit there next week.